The 3dRudder Black Edition is a special bundle including a 3dRudder for PC & VR + a pair of foot bars + a pair of black pads. The 3dRudder for PC & VR is the 1st ever foot controller to offer full freedom of movement powered by your feet in Virtual Reality & PC games. Also a great accessibility controller on PC and on Xbox via the Xbox Adaptive Controller. Winner of 4 CES “Innovation Awards”. The 3dRudder foot controller was designed to bring motion experience to the next level in Virtual Reality and standard games on PC. Speed up, slow down, stop when you chose to and go exactly where you want to. 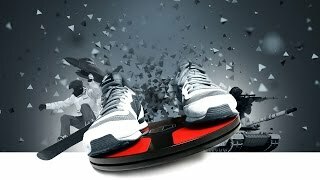 The 3dRudder grants you full freedom of movement in your games. Move forward, backward, strafe, rotate, and combine directions to move like in real-life, just better. While you manage motion with your feet, your hands can finally focus on action. You get fully immersed in the game. Whether you play standard PC games, VR games, or Xbox games via the Xbox Adaptive Controller, the 3dRudder proves an incredibly useful foot controller. The 3dRudder motion controller is compatible with Virtual Reality games bought on Steam VR & Oculus Store, either on a plug-&-play basis for games that offer native support, or via the 3dRudder Dashboard. The 3dRudder motion controller is compatible with almost all PC games for standard screens. It's a long list! 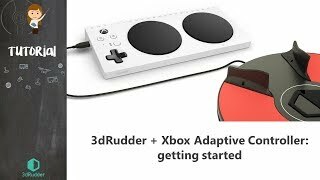 The 3dRudder is compatible with all Xbox games when it is plugged in the Xbox Adaptive Controller. 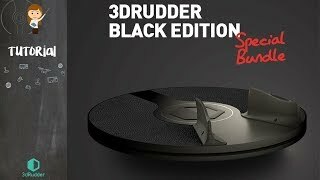 Turn your 3dRudder for PC & VR into a Black Edition. The Black Edition is a special bundle including a 3dRudder for PC & VR + a pair of foot bars + a pair of black pads. The foot bars offer a perfect grip while playing fast-paced games, and the black pads give your 3dRudder for PC an irresistible all black look. The 3dRudder for PC & VR is the 1st ever foot controller for en enhanced motion experience in Virtual Reality & PC games. Also a great accessibility controller. 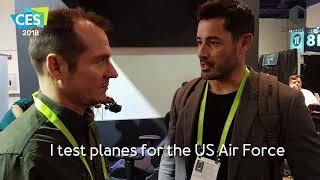 Winner of 4 CES “Innovation Awards”. A groundbreaking foot-powered gaming, VR and 3D motion controller. Discover a new gaming experience. Move through your existing PC games and the new emerging VR worlds with your feet. Surprisingly intuitive and natural, it only takes a few seconds to master. Your hands are now free to shoot, grab, pull, push… You’re more immersed, more engaged. The 3dRudder comes with its intuitive and simple software Dashboard that will let you shape your own experience and choose between its various modes (keyboard keys, mouse, 3- or 4-axes joystick…). Also a great accessibility device to play PC games, and Xbox games via the Xbox Adaptive Controller. How to assemble your Black Edition? Peel the original red pads off the 3drudder, and put the black pads on (they have an adhesive back side). Then mount the foot bars on the 3dRudder. Parcel includes : a 3dRudder for PC & VR, a pair of foot bars + screws & screwdriver, a pair of black pads with adhesive back side, and the assembly instructions. Installation takes less than 10 minutes. Watch the video for more information.